Hi, everyone! This is Caly Person. Thank you so much for joining me. 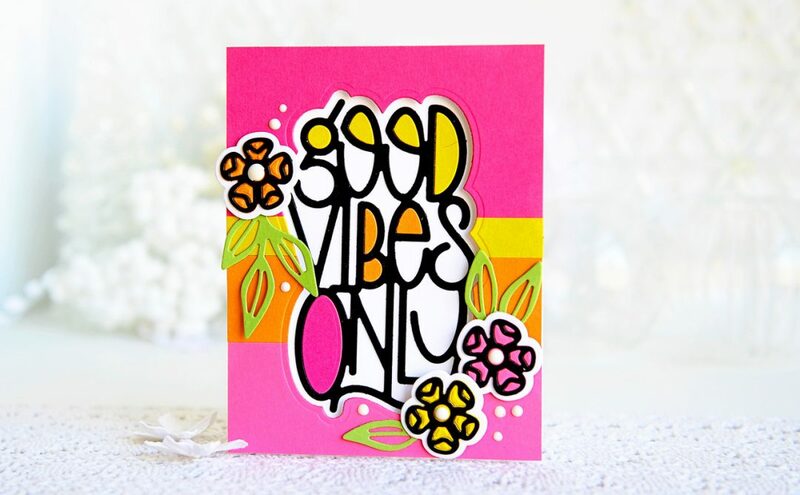 Today I’m sharing projects from the Good Vibes Only collection by Stephanie Low. 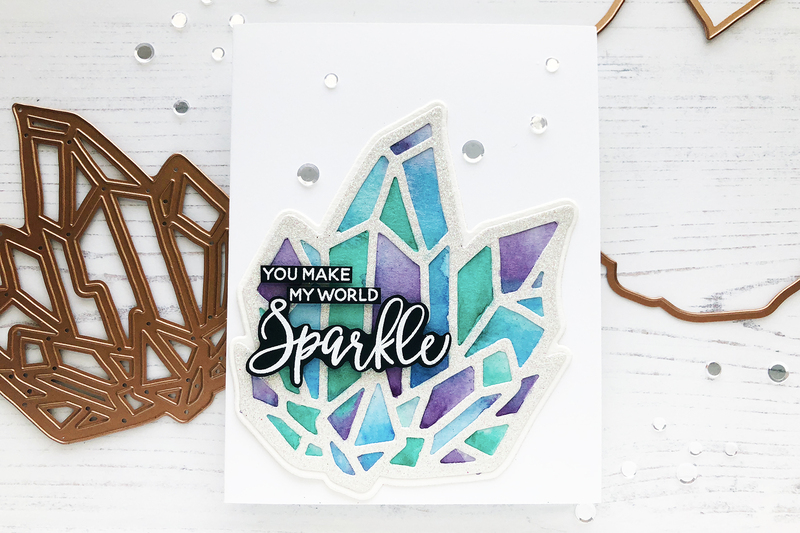 I’ve made two cards using watercolor backgrounds with two ways to accent the die cuts from this collection. On my first card, I used the Spellbinders Embossing Mat. 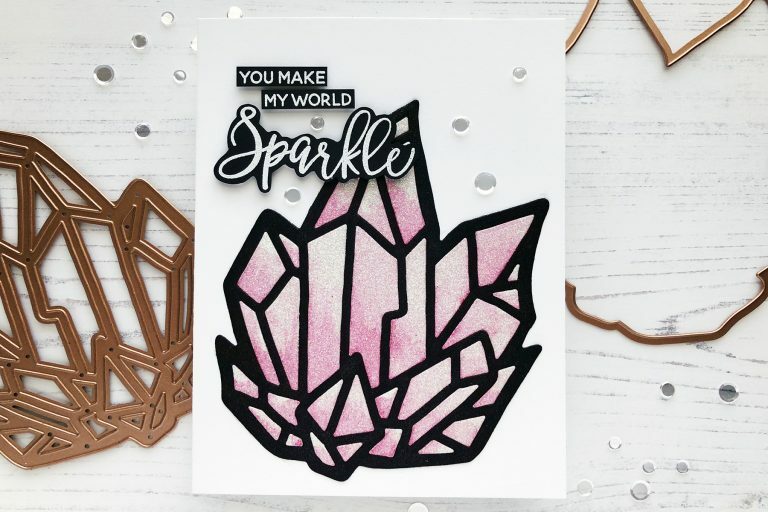 I placed the main Crystal Peaks die in the bottom left hand corner and embossed the die onto some watercolor cardstock. Instead of drawing lines for each space, I thought this would be the quickest way for me to paint. 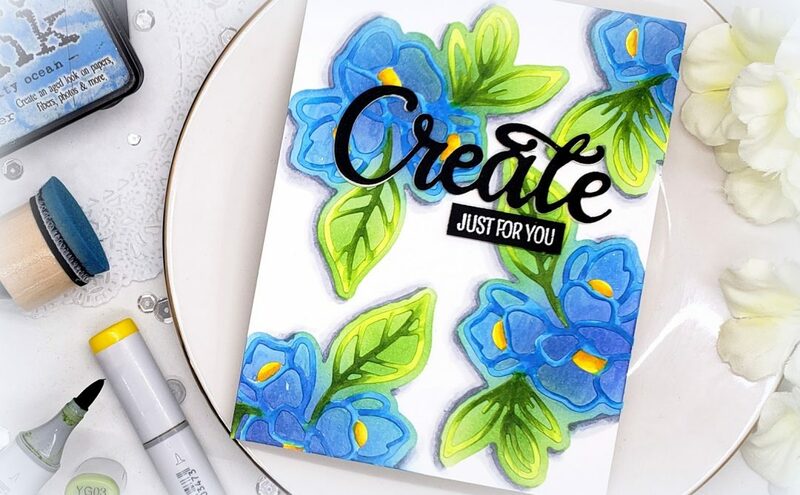 I used Daniel Smith watercolor paints on this card and used the following cool colors: Phthalo Blue GS, Quinacridone Purple, and Phthalo Green BS. I tried to add more concentrated colors towards the bottom of each section. Once the watercolor was dry, I die-cut this piece using the outline die. Then I die-cut the Crystal Peaks die using white glitter cardstock and adhered it over the watercolor panel, giving it more defined edges and shimmer. 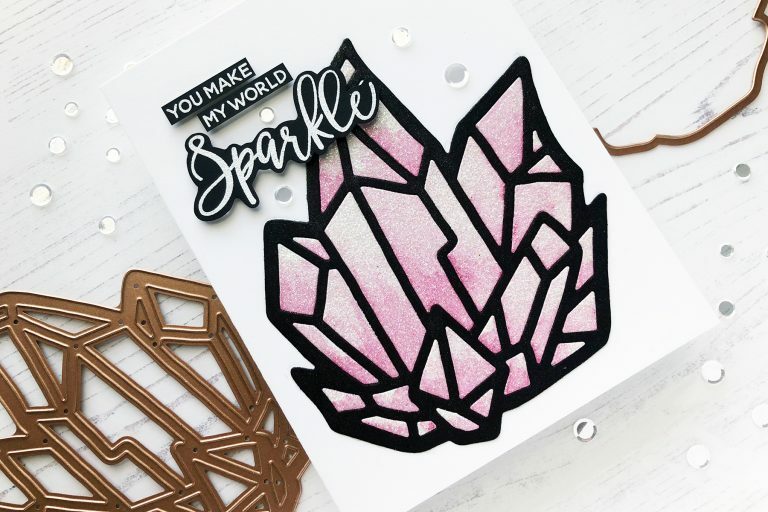 On my second card, I decided to use the negative from the white glitter cardstock on the previous project and repurpose them for a second card. I die-cut the Crystal Peaks die using black cardstock and colored this with a Wink of Stella shimmer pen in clear to give it extra shimmer. 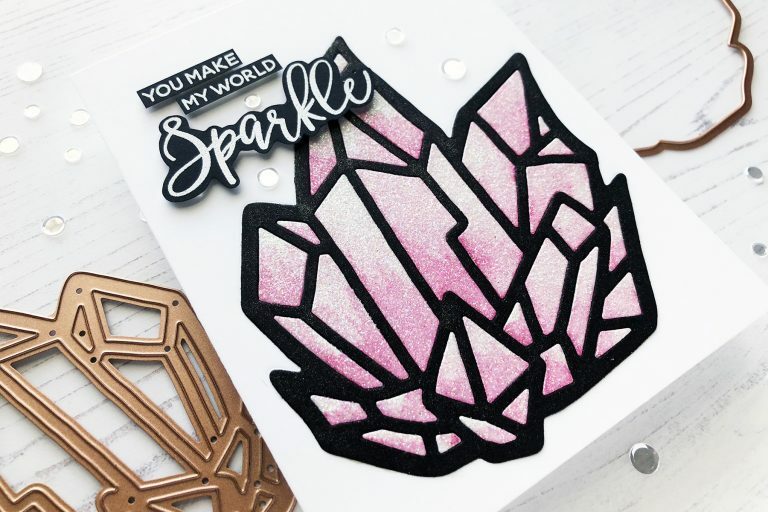 I then in-lay all the white glitter cardstock back into the Crystal Peaks image. 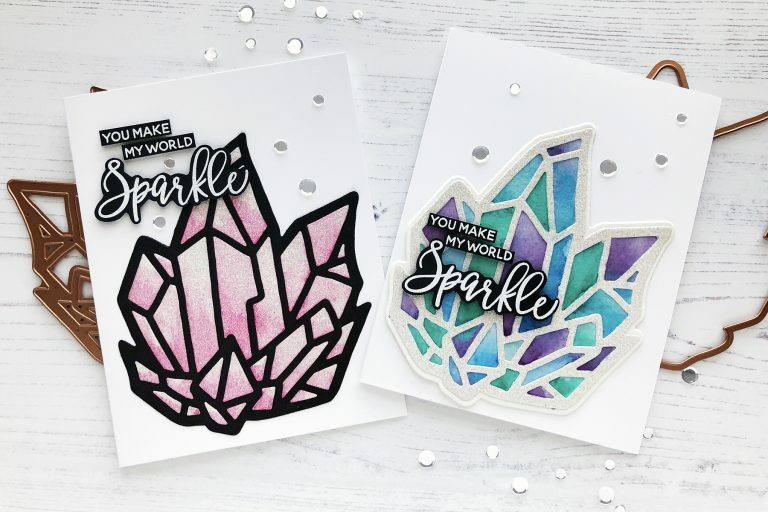 I wasn’t quite satisfied with the white glitter cardstock and felt it was a little flat and on a whim, I decided to add some watercolor over the white glitter cardstock – taking a huge risk that it wouldn’t take the moisture well. It turned out to be easier on the glitter cardstock than on the watercolor paper from the previous project! I was pleasantly surprised! 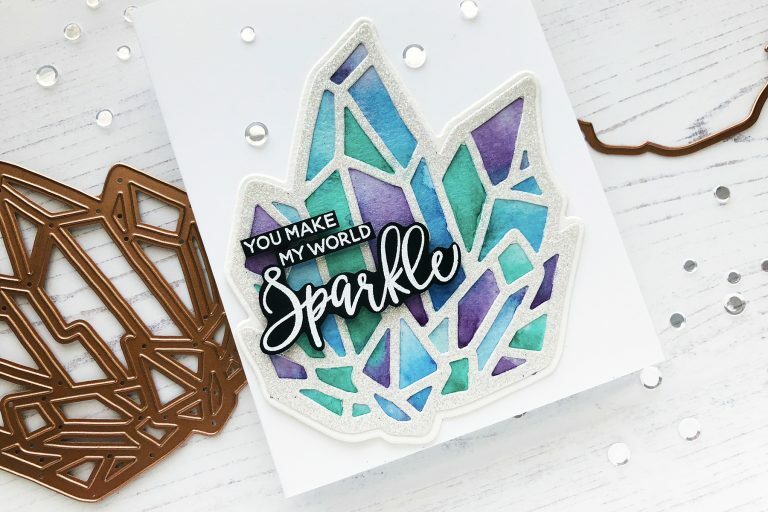 I used a stamp set by Ellen Hutson called Spread the Sparkle to both cards in different places. I stamped the sentiment using Versamark Ink and embossed it using white embossing powder. 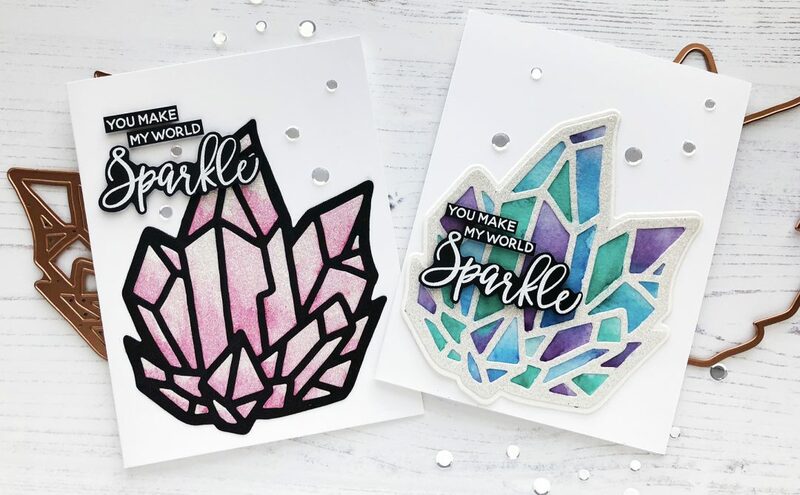 To finish off both cards, I added some sparkling clear sequins. I’ve enjoyed being a guest here on the Spellbinders blog and am extremely grateful for the experience! 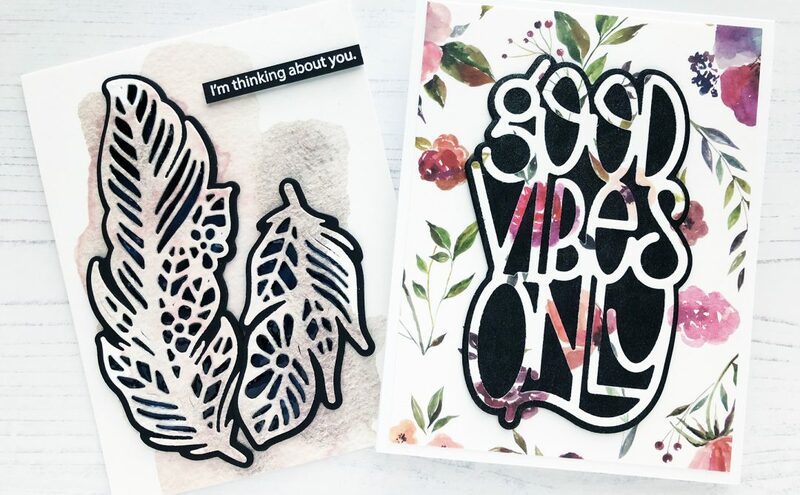 I really hope you enjoyed these cards today and I’ve inspired you to create! I love the intricacy of some of your latest dies. They allow for layering and I personally love as much detail in my dies. 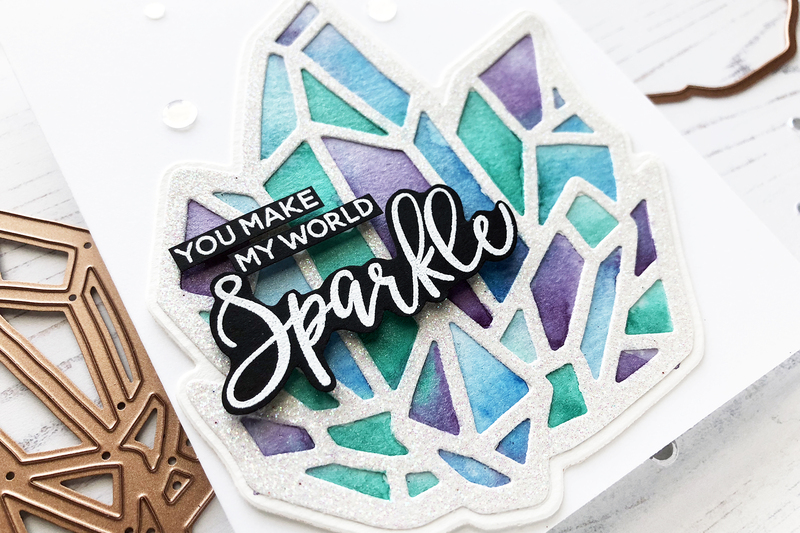 Becca, I absolutely love your cards – the dies are beautiful and it is so nice to be able to watch a video on how the cards are made using these dies. Makes it so much easier for me personally. Where is the video showing how these cards are made?